I've been a busy little Quilting Bee. I didn't really mean to start a new quilt, let alone 2, but a friend from work introduced me one day to the "Stack and Slash" method. You first of all have to decide what size your finished quilt will be and cut your fabrics into squares or rectangles that are all the same size. So my first quilt was the size of 6 fat quarters and I had 6 different shades of red. Then you stack the fabrics on on top of another, pin a number (in this case from 1 - 6) on them and safety pin them all together in the top left hand corner. Then using your cutter and ruler, cut through the six layers. It doesn't really matter where you cut, I usually make a cut leaving me with a largeish triangle in the bottom right hand corner. Then take the loose triangles and move the bottom triangle to the top of the pile. So you still have 6 squares of fabric but each square is now made of 2 different fabrics. Sew each square back together. Pile them back up (this is where the numbers come in handy so you get them back in the right order) and make another cut through the 6 layers (in a different spot). I usually make 3 or 4 cuts in total, moving a piece from the bottom to the top and sewing them back together after each cut. 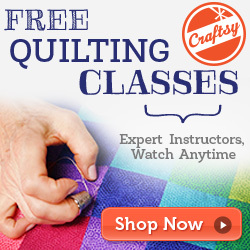 Once you are happy with the variety of fabric and the shapes you have you can sew your squares or rectangles together. Your edges will end up a bit raggedy, especially if your pieces aren't exactly the same size to start with, but you can always trim them at the end before you bind your quilt up. This method is really simple (probably doesn't seem so from my instructions) and it takes about an hour to make a whole quilt top. Another thing you can do is put small strips of a black fabric in between the pieces before you sew them back up - giving you a stained glass effect. The first one I did was with 6 fat quarters of red fabrics, it's almost the size of a single bed quilt. Then I put a border on in a red spot which really made it look good. I made 3 cuts to these squares and the pieces are quite uneven in size, I could have made another cut but then again I like the really random nature of the sizes. This one is for me to keep and it'll be a throw rug for our couch. The second one was with 4 fat quarters and I put a border between them, rather than around the outside. I made 4 cuts in these squares to make the pieces a bit more even in size, all this does is mean that your fabrics are repeated in each square. This quilt is for my friend's daughter, it will double as a play mat and cot quilt. Nex time I do one of these I'll take some more photos and make up a proper tutorial. Now all I've got to do is figure out how to quilt them!